Free advice on how to fix your bicycle: The difference between a good chain tool and a cheap chain tool. The difference between a good chain tool and a cheap chain tool. "I must be doing something wrong here--I am trying to replace an old, rusty chain from a mountain bike. I bought a new chain and a chain tool, but I can't figure out how to use the chain tool. I am lining up the chain with the guides on the tool, but the pin will simply not budge. I have checked, and double checked to make sure that the tool is aligned with the pin, but nothing happens. Just to verify that it wasn't the rusty chain, I also tried using the chain tool on the new chain, but the pin barely budges. I actually used so much force that the guides on the tool bent. So, the question is--how much force is needed to remove the pin from the chain links? From your video and others on the web, it looks relatively easy, but when I tried it, it was near impossible. Do I just need to get a higher quality chain tool? (The one I bought was from Wal-Mart for $6...) Or am I doing something totally wrong? Well first off you shouldn't waste your chain tool on a rusty chain that you will throw out anyways. Cut it with bolt cutters, a hacksaw or a suitable power tool if you happen to have it. If you don't have that option, you should at the very least lube up the link that you will break prior to using the tool on it. Align the link and tool pin properly and use any amount of force necessary. Now let's address the last question, should you get a better tool? The short answer is yes. There is a definite difference between a cheap Chinese chain tool and a quality tool like the Park's CT-5 at $20 pictured above on the left. The steel used is of much better quality and you can actually feel the closer tolerance of manufacturing when using it's smooth pushing action. The $6 Chinese model, pictured above on the right, is made of much cheaper material and when you use it, you actually feel the rough action. It's as if every part is fighting you not to do it's job when using it for it's intended purpose. Now both of these tools are mine and if you think that the oldest one with the most chains opened is the Park CT-5, you are wrong. The $6 cheapo on the right was the first chain tool that I bought 17 years ago for $4 actually and I've opened hundreds of chains with it. 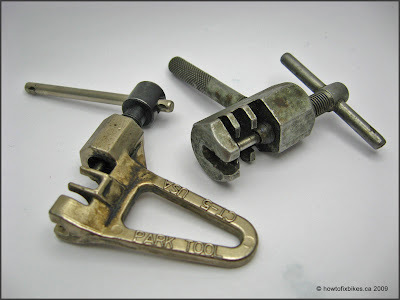 These tools are made to last between one and four chains only but there is a way to make them last longer, lubrication. I used automatic transmission fluid on the thread and pin of the tool every time I used it. The friction from pushing on the pin can sometimes create heat that won't help things with that cheap metal they use. I bought the Park tool 5 years ago because I figured I was overdue for a nice chain tool. I still keep the cheapo around as a spare for when I waste an hour looking for the good one somewhere in the mess that I call my workshop. So bustabuckt, it's time for a new chain tool. You can't go wrong with a quality item like the CT-5 by Parks but if you can't, a cheap one will do fine just as long as you baby it with some lubrication and don't expect much from it. Glad to see you've got back to blogging more regularly! Thanks for the chain tool article. Very instructive. I'm just getting into bike maintenance so posts like that are really helpful. Now, it's my understanding that regular Joes can't buy direct from Park. So I'm assuming I oughta go thru my LBS unless you've got any other suggestions. Oh yeah, I also read all your bike-building exploits. Fascinating. I'd love to learn more. I've got a cheapo chain tool that seems to work well, except the stem that screws into the main body of the chain tool keeps falling out. It's more frustrating than anything. I like the integrated handle on the Park chain tool. Thanks for the comment Bob. Most LBS (Local Bike Shop) carry Park tools. Big Oak, it is true that the Park is a dream to operate compared to the other one. But the cheapo still manages to get the job done, just not as well. Thanks nbbb. I have a thing for macro shots. Could I ask your advice about a "multi" tool. I mountain bike and weight is everything. I bought a lezyne crv 12. Seems quite sturdy but I have not had to break a chain yet. Any opinion? Any tool is better than no tool. Find a crappy chain and use it before you go out in the trail. Only by doing will you find out if it works for you. Somehow, I'm sure it will. Also try all the other gizmos on that multi tool before you actually have to use it.